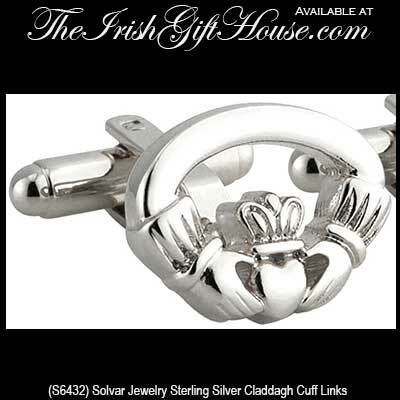 These Claddagh cuff links have been hallmarked sterling silver by the Irish Assay Office at Dublin Castle in Ireland. These sterling silver Claddagh cuff links are an oval design that measure 3/4” wide. 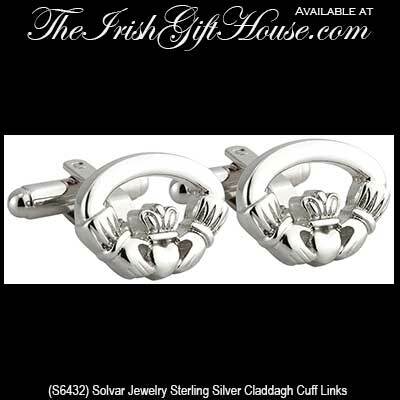 The double hinged Irish cuff links are made by Solvar Jewelry in Dublin, Ireland and they are gift boxed with a Claddagh legend card, complements of The Irish Gift House. Sterling silver Celtic cuff links feature traditional Trinity knots. Sterling silver Celtic cuff links feature elaborate Trinity knots with an interwoven circle. Sterling silver Celtic cross cuff links are enhanced with Trinity knots.